Have you ever watch skiers glide down the ski slopes like they were floating down effortlessly? They are parallel skiing. This is really what skiing is all about. You have probably already learned what the snow plow is. The snow plow is what beginners start with. Once you learn to parallel ski, you do not need to do the snow plow any more. The basic difference between parallel skiing and snow plowing is in how the two skis are positioned next to each other. In snow plowing, the front of the skis are pointed toward each other, with the back of the skis further apart, thus making a V shape when the skis are next to each other. In parallel skiing, the skis are parallel to each other. The front and the back of the skis are equidistant from each other. The skis are as far apart as the width of your hip. In the beginning, you may feel more stable if your skis are further apart. However, if the skis are too far apart, you will find it more difficult to make turns. At hip’s width, you have an easier time moving your skis forward in the same direction. Your turns are more fluid. There is a technique called power parallel that helps you do very clean turns. You can start with the plow down the slope. As you turn, bring your inside ski in so it is parallel to the other ski as you finish your turn. Once you can do that, you can go to the next step and try to do the whole turn in parallel skiing. Keep your body stable as you use your lower back and hips to bring your inner ski into the turn and with your outer ski following in parallel. Your body’s weight is actually not on both skis evenly as you turn. More weight is placed on the outside ski when you are going into the turn. You are also skiing on the inner edges of both skis. Then, as you finish the turn, your skis flatten and your weight is again on both skis. 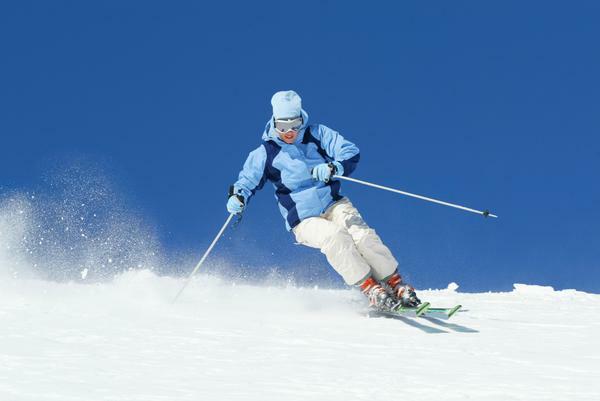 For example, if you are starting to turn left, your weight will shift more to your right ski at the start of the turn. As you are finishing your turn, shift your weight back evenly on both skis. Your skis should remain parallel to each other at all times. Of course, all of this will take a lot of practice. Do not try to go fast in the beginning, or you will end up falling a lot. Keep your knees limber and bent because you need to make fine adjustments to your turns. Your back should not be straight up but slightly bent over the skis as you head down the slope. Avoid leaning back because if you do, you lose your center of gravity and will fall. Once you learn how to parallel ski, you can go faster, and you will truly enjoy the freedom of floating down the slopes.